Someone once said that the more you value something, the more precisely you measure it. The example given: you account for lettuce using a general term of “heads”, yet you weigh diamonds to the precise carat. Not only are there two time zones to contend with, but one (erroneously) is only 50 minutes ahead of the other instead of an hour. Apparently “vacation time” is much more lax! 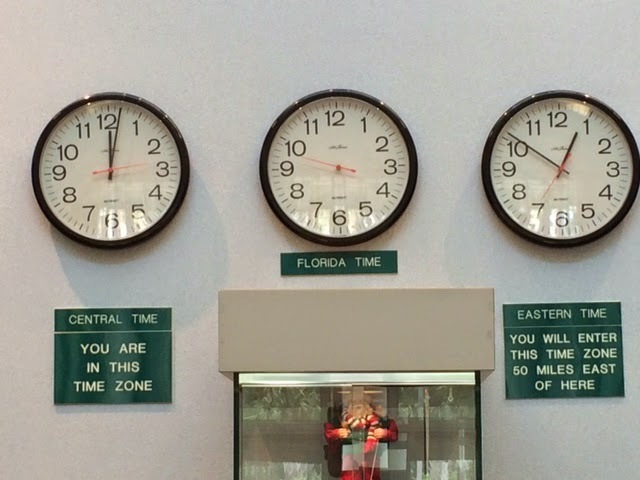 Whether you follow U.S. Official Time or approximate like Florida does, time is your most valuable resource. Try to ensure that your whole organization is synced to one method of calculating it. Those 3-4 (or 10) lost minutes can really add up over time. Thanks to Emily for the Bryant email. A colleague told me about a college president who went to a post-graduation party with students and got so drunk that he was dancing on the tables. You know the rest: people took pictures and posted them on Facebook and his credibility, if not his job, is lost forever. What was he thinking? He was about as smart as the bookstore manager in Missouri who was caught with $80,000 cash in his desk — discovered by someone when they opened a drawer to borrow a pencil. His total embezzlement turned out to be much greater. Locally, we just heard tales of the city librarian who stole more than $70,000 in fines that were paid in cash. Fines are twenty cents/day — so it would take 250,000 fines to pilfer that much. That is a long time of tossing the coins in a pocket instead of a cash drawer. And last week’s gem — a Connecticut student called in a bomb threat in an attempt to cancel her college graduation — rather than face her mother and confess that she had been using the tuition money from her for other pursuits besides attending class. She had gotten away with dropping out, that is until graduation came and her family wanted to attend the ceremony. Fortunately, most of us never attempt anything like these examples. We don’t dance on tables, steal money or phone in bomb threats. But many do smaller things that defy common sense and have the potential to tarnish a reputation. Your actions are archived, never deleted, especially in this era of cell phones and social media. Take care that your small actions don’t compound themselves or hound you in the long term. 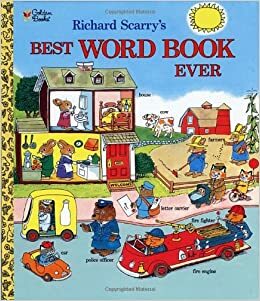 A colleague just had a baby and so I sent the family my favorite baby gift: Richard Scarry’s Best Word Book Ever. Apparently I am not the only one who likes this gem as the book has been in print for over fifty years and sold over a half million copies. Amazon estimates that children all over the world have learned over a billion words through Scarry’s books. The Best Word Book Ever is really just that — no story, rather pages with critters and objects and shapes that Scarry labels. I spent hours and hours with the book and a sibling in my lap: “find a car”, “find an ear of corn”, “find a bottle of milk”. And on it went. Scarry’s formula is way outside the mold of the typical children’s book. There is no linear narrative, no page with one large illustration on it, no dumbed down words that children might not know. And it worked for him, as he has a whole series of books in the same style: Cars and Trucks and Things That Go, What People Do All Day, A Day at the Airport and Busy, Busy Town. Think about the message that you want to express, and then think of how you can convey it in your unique way. As Scarry proved, there is no template for what works. Sometimes what people are craving is what isn’t there now, not more of what is. I just read an article about University of Alabama football coach Nick Saban’s strategy of using special teams. Most football coaches focus on offense or defense, but Saban focuses on the men who come in to perform a specific task. Instead of filling teams with second string players, he puts some of his stars on these short-term units. All of the greats, including Alabama, have strong offense and defense. The special teams provide them the margin of success to gain advantage in the critical moments. In your organization, do you only focus on the offense and defense — paying attention to the usual suspects while neglecting to develop and motivate the occasional player? As a coach, do you provide attention and opportunities for all the members on your team? Do you think about ways to capitalize on the margins instead of competing head to head in the same ways that your competitors do? Think about your support staff, your night shift, the student employees or the people your guests meet on the way to meet you. Are they winning you points or detracting from your game? Saban sets a good example of where he invests his time and resources. For Alabama, the special teams are, well, indeed special. Try to make them important in your organization too. There is a new issue of postage stamps out that feature reproductions of vintage circus posters from the 1900s. Marketers today could take a lesson from them. The posters have vivid colors and few words so they stood out when plastered about a town. The circus had to rely on these and word of mouth to generate a crowd in every town. No mass advertising. No social media. No web. So posters it was. In 1911, Ringling Brothers printed 123,000 posters to promote 143 shows — allowing them to cover entire walls with their announcements. The posters were big (usually 42 x 28 inches) and full of vibrant colors and beautiful sketches. The circus poster is credited with being the earliest form of outdoor advertising, eventually evolving into billboards as we know them today. Until I read the background description about the stamps, I had not thought of the evolution from poster to billboard, but it puts them in a new light. Promoters today would cringe at the idea of filling an arena using only posters. The fact that P. T. Barnum and Ringling Brothers did it night after night as they traversed the country may have been the greatest part of their show. Learn from them that pictures really do have more power than words. Then they learn that the cities were chosen because I vacation with my sister and she is on a quest to see all the state capitals. These will make #47 and #48. * Suddenly, my odd selections for time away make sense and actually sound like a cool idea. If someone around you makes choices that are outside the norm, seize it as an opportunity to ask questions and discover a new way of thinking. In the end, it may not be for you, but it most likely will be for a reason you hadn’t thought about. That alone is a prize. I love to hear stories about how products or companies were named (like DAR Racing in Blog #703). The latest brand that caught my attention is Wild Pig wines. “The shrewd and sneaky swine that descends from the Cevennes mountains to pillage the finest grapes of our vineyards! Such a smart and gluttonous pig deserved a special cuvee in her honor, a way for us to remind her: “You didn’t get all the best grapes!”. There I read about their “piglosophy”, took a quiz to discover “what kind of wild pig wine are you?” and could download screensavers and wallpaper. — and be sure to share your story to give your brand a personality that extends far beyond the literal product.